2007 New Yorker Article Exposed US-Israeli-Saudi Conspiracy to Overthrow Assad. Muslim Brotherhood is funded by & serves as the primary instrument of US, Israel, & Saudi Arabia. 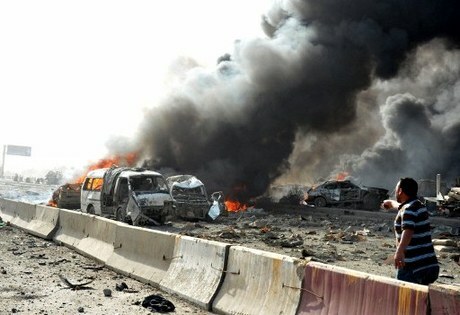 Lebanon was designated as staging ground to destabilize Syria with sectarian extremists. Saudi and Muslim Brotherhood anti-Israeli and American sentiments are feigned. US intelligence knew in advance unleashing sectarian extremists would result in genocide. Saudis & Americans admit sectarian extremists - the foundation of Al Qaeda - are under their control. May 10, 2012 - As previously stated, the Muslim Brotherhood and various "hardline" sectarian political factions sweeping into power in the wake of the US-engineered "Arab Spring," have been feigning anti-Israeli and anti-Western sentiments in an attempt to swell their ranks with followers before ultimately forming a united sectarian-front against Iran. The creation of a united sectarian-front was noted by geopolitical analyst Dr. Webster Tarpley who has from the beginning stated that the various possible governments resulting from these engineered revolutions "could then be used to support the fundamental US-UK strategy for the Middle East, which is to assemble a block of Arab and aligned sectarian countries (notably Egypt, Saudis, Gulf states, and Jordan) which, formed into a front with the participation of Israel, would collide with the Iranian Shiite front, including Syria, Hezbollah, Hamas, and various radical forces." Image: Red = US-backed destabilization, Blue = US occupying/stationed. Iran and Syria are completely surrounded by either client states or nations occupied by US forces. And while the complexity of West's reordering of the Arab World is staggering, it is but a part of a grander strategy to eliminate the nation-state and establish global hegemony. Confirming this is a 2007 New Yorker article recently pointed out by a reader titled, "The Redirection: Is the Administration's new policy benefiting our enemies in the war on terrorism?" Written by renowned journalist Seymour Hersh, it covers everything from admissions that the US, Saudis, and Israelis are working together, despite the Saudis and their sectarian proxies' attempts to portray themselves as "anti-Israeli," to admissions that the US is funding a region-wide network of militants and terrorists, many of whom have literally trained at Al Qaeda camps. The article also describes in great detail the role of the Hariri faction in Lebanon, working closely with the Saudis and Americans, and their role in creating a safe haven for terrorist organizations on Lebanese soil, now involved fully in destabilizing neighboring Syria. Clearly, what has been recently portrayed by the West as mere "claims" by the Syrian government that the Saudis, Lebanese, and NATO were conspiring against them, is simply the fruition of the US policy exposed fully in the New Yorker in 2007. While many analysts have treated the rise of the Muslim Brotherhood in Egypt and their involvement in Syria's uprising as a somewhat nebulous phenomenon, the New Yorker's 2007 makes it clear that the Brotherhood is one of the primary instruments used by the Saudis as part of a US-Israeli-Saudi effort to eliminate Syria and Iran. Not only that, but the report indicates that the US itself has been funding and using the Muslim Brotherhood as well. Just as the US State Department feigned shock and confusion at the "Arab Spring" it had been preparing for the last 3 years, it is likewise reacting with feigned confusion and dismay over the rise of the Muslim Brotherhood in the "Arab Spring's" wake. In reality it is a premeditated consequence of US foreign policy spanning both the Bush and now the Obama administrations. 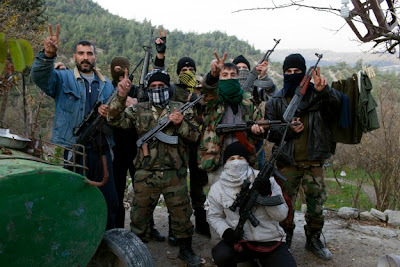 Photo: The "Free Syrian Army," whose composition consists of not only Syrian sectarian extremists, but Libyan terrorists from the US State Department listed "Libyan Islamic Fighting Group" led by Abdul Hakim Belhaj, is the manifestation of years of US, Saudi, and Israeli aid since at least 2007. While in 2007, all of this was, "soon to be," in retrospect we see just how devastatingly accurate Hersh's reporting was. It is clear now, with the rise of the Muslim Brotherhood and the sectarian-extremist dominated, foreign-funded destabilization ravaging Syria, that this policy created during the Bush administration, has transcended presidencies and is being brought to its premeditated conclusion under Obama - yet another example of "continuity of agenda." Saudi Arabia, Israel, and the United States Are Behind Syria's Violence. The evidence trickling out of the corporate-media regarding who the armed Syrian opposition is, reveals that it is predominately an extremist sectarian-movement, not only including Syrian extremists, but militants crossing the border from Iraq, Jordan, Lebanon, and even from as far as Libya. An alliance of Gulf States led by Saudi Arabia have pledged funds for Syria's militants and has repeatedly called for openly arming them. The US is likewise openly equipping Syrian militants. That the United States, Israel, and Saudi Arabia premeditated a regional conflict utilizing militant-extremists with full knowledge they would commit wide ranging, genocidal atrocities, is clearly as much in reality a war crime as the US State Department and US representative to the UN Susan Rice have claimed the Syrian government has committed as it desperately attempts to restore order in the face of an admitted act of foreign aggression. The Muslim Brotherhood is a Tool of US-Israeli-Saudi Machinations. The Muslim Brotherhood is often portrayed as being anti-Israeli, anti-US, and anti-West in general. In reality they are a creation of and have been ever since servants of expanding Wall Street and London's corporate-financier hegemony across the Islamic World. In Hersh's 2007 report, it is made clear that the Brotherhood was the tool of choice of the US, Israeli, and Saudi elite - with the US and Saudis reported as even then directly funding and backing them - backing that continues to this day, not only in Syria, but in Egypt as well. The Muslim Brotherhood's rank and file surely believe in what they are being told by their leaders, but their leaders are professional demagogues peddling anti-Israeli and anti-American rhetoric solely for public consumption while being fully complicit in the West's designs against the Arab World. It was warned that such backing would benefit the Brotherhood as a whole, not just in Syria, and could effect public opinion even as far as in Egypt where a long battle against the hardliners was fought in order to keep Egyptian governance secular. For Empire, not National Security. The only fault that can be found in Hersh's tremendous journalistic accomplishment is perhaps the pandering to the notion that all of this demonstrative deceit and indeed, criminality, may be being done in the interest of protecting Saudi Arabia, Israel, and the United States. In reality, even the Brookings Institution, which was also included in Hersh's report, admits that containing Iran is not a matter of national security for either the US or Israel (let alone Saudi Arabia), but a matter of maintaining the status quo, namely Western hegemony across the Middle East, with Saudi Arabia and Israel the principle dual benefactors. 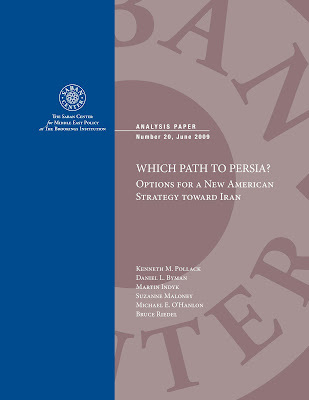 While behind closed doors US policy makers admit Iran, even if it were to obtain nuclear weapons, is driven by self-preservation and protecting the influence it is steadily gaining throughout the Middle Eastern region it borders, the message they desperately seek to relate to the public is one of an irrational apocalyptic theocracy eager to usher in Armageddon. However, reports out of the RAND corporation note that Iran has had chemical weapons in its inventory for decades, and other reports from RAND describe the strict control elite military units exercise over these weapons, making it unlikely they would end up in the hands of "terrorists." The fact that Iran's extensive chemical weapon stockpile has yet to be disseminated into the hands of non-state actors, along with the fact that these same elite units would in turn handle any Iranian nuclear weapons, lends further evidence to the conclusion that Iran is indeed driven by self-preservation and self-defense. Brookings notes on pages 24 and 25 of their "Which Path to Persia?" report, that the real threat is not the deployment of these weapons, but rather the deterrence they present, allowing Iran to counter US influence in the region without the fear of an American invasion. The US and the West in general, have viewed the Middle East as nothing more than a divided, broken Ottoman Empire to be used and exploited, and when nationalism or resistance emerges, to be pitted against itself in destructive conflicts. The fear of a powerful Iran overturning the status quo of Anglo-American hegemony expressed through proxies and multiple strategies of tension, Israel itself being one of them, would open the door for other nations to climb out from beneath the modern heirs of the British and French Empires and begin down the path of true self-determination. That includes freeing the people of Israel laboring under a hijacked government misleading them into a pointless and perpetual conflict with not only the Palestinians, but with the Islamic World itself. Indeed, the ploy described in incredible detail by Seymour Hersh in 2007, and demonstratively playing out before our eyes today, is not to protect against existential threats to the people of Saudi Arabia, Israel, or the United States, but against existential threats to their leadership's self-serving hegemonic ambitions. It is being peddled by a coalition of Saudis, Americans, and Israelis lying not only to the world, their allies, and their enemies, but to their own people about the nature of the conflict they demand troops and taxpayers to facilitate. Image: Terrorist bombings have recently ripped through Damascus, Syria, bearing all the hallmarks of sectarian extremists, funded and directed by the US, Israel, and Saudi Arabia since at least 2007, according to Seymour Hersh's article, "The Redirection." With the back-story now fully established, and the violence in Syria exposed as not only premeditated, but the devastating consequences of unleashing sectarian extremists being well known ahead of time, those insisting on backing this horrendous crime do so amidst a public increasingly aware of their transgressions against humanity. Balking these murderous machinations is accomplished by Sunnis and Shi'ia not falling into the traps laid out by the US, Israel, and Saudi Arabia in the form of the Muslim Brotherhood, and terror groups and "civil society" NGO's alike, cultivated by these admitted international manipulators. Christians and Jews must likewise avoid the contrived "clash of civilizations" between themselves and hordes of terrorists created and cultivated by their own demagogic leaders. Finally, it is essential that people around the world recognize that the corporations and institutions they patronize on a daily basis with their time, money, energy, and attention are the ones ultimately devising and driving not only these plots, but the disingenuous politicians and media personalities we've mistakenly placed our trust in. We must begin to boycott and replace these corporations and institutions with genuine local alternatives or suffer the tragic conclusion of allowing such deceitful megalomaniacs construct an inescapable world order they shall presume absolute dominion over.